Whew, growing up so fast! I remember dinosaur cakes with my oldest two who were only 10 days apart in birth. They are now 26 and 24. It would have thrilled me at that age, wait a minute I would still be thrilled to get one. Boys just like that stuff I guess. Now that is a cool cake !!!! Happy birthday to your boys! And that cake turned out cute. Very cute cake Lisa!! Happy Birthday to the boys. Happy Birthday Cort and Reid!That is an awesome looking cake. I can see why the boys were thrilled. I to prefer to work with butter cream but most of my adult children want the fondant look. I do a marshmallow fondant for their cakes. They like it but I think its too sweet. I can wait to see your truck cake. Oh they are growing up so fast! Happy birthday to Cort & Reid!! Love the cake! I am sure the twins were thrilled too. My kids love decorated cakes too. Happy Birthday to Cort and Reid! And that cake is awesome! I love the river and the volcano and all the activity going on. I bet the boys were thrilled. it looks delicious. Happy Birthday to Cort and Reid! The cake looks delicious! You are very talented and creative. I totally love your cake. The water slide and volcano are over the top. I am going to pin this. What a great cake! Hope they had a fabulous birthday!!! the fanciest cake I've ever made was a teddy bear cake for 10 very discerning 6 year old's, it passed the test yet I was a wreck, lol, this is a super amazing birthday cake! and that cake looks AWESOME!!! Awww, happy 4th to Cort and Reid! How exciting. Looks like the perfect cake for them! Great job! Now I buy them from the bakery because I am lazy in the kitchen. Happy belated to your sweet boys! This cake is wonderful! I think my favorite is that volcano, but also they can play with the little dinosaurs long after. And oh my gosh, you even added dinosaur eggs in little nests! And all the chocolate!! For the longest time, I looked and looked at the rock border, wondering where you got such pretty rocks. Then it HIT me, maybe jellybeans!! Can't wait to see the truck cake!!! P.S. I love the river that has waterfalls and a turtle swimming in it with a croc! The boys must have gone absolutely NUTS!! I love dinosaurs too! And i'm a fifty year old, old lady. Lol. Their cake looks yummy. And yes, buttercream all the way i say! That turned out super cute I think, and you're right about fondant. Who needs that ill tasting uck anyhow? Glad the twins loved this dino creation! Happy birthday to Cort and Reid! I agree with you that fondant doesn't taste very good. Someone should invent delicious fondant LOL. 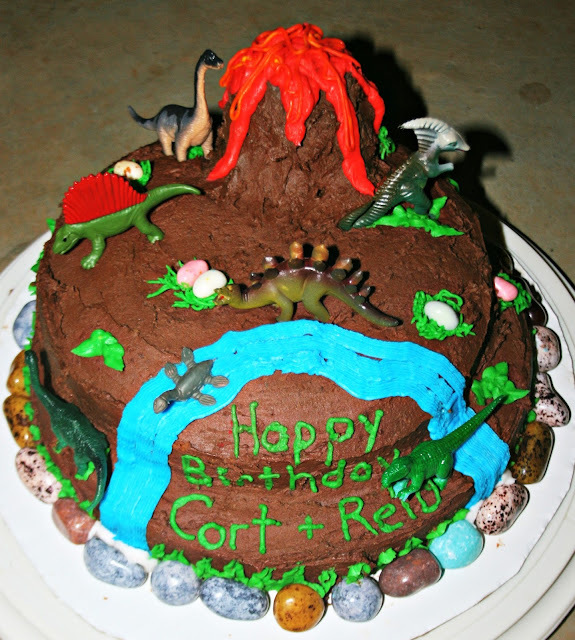 I would be thrilled if someone made me a cake that looked like your dino cake! Love your dinosaur cake, Lisa. 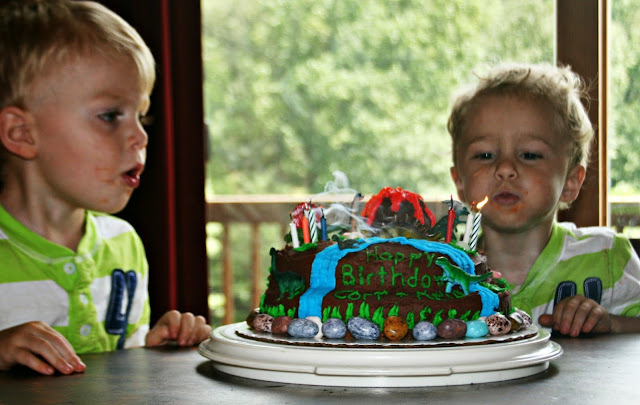 I"m sure that the twins LOVED it... What a cute photo of them blowing out their candles.....Love it!!!! Can't believe they are FOUR already!!!! After seeing your pictures of your boys birthday, I went into the study and looked at the pictures on the wall. There's one little frame that has my son's birthday party when he was about 10. Not a day goes by that I don't think back to when we all lived together up here on the mountain. Now they are grown up and gone. Enjoy those little guys, too soon they'll be calling you from college needing pocket money. Happy Birthday to Cort and Reid. Harry's comment is so true. I often think of my son at this age. Oh, what a great cake! I would have loved a cake like that when I was a kid. Happy Birthday!!! Great job on the cake! Happy Birthday to the boys! You did a fantastic job with the dinosaur cake! I always wanted one of those cakes with the plastic animals on them, but my mom wasn't into that kind of thing. Love it! You are a talented cake decorator. The boys are growing up fast. Happy 4th Birthday to Cort and Reid. The cake came out perfect....really cute. HAPPY BIRTHDAY! Dinosaur cakes are so cool!